It’s not everyday you get to spend time on the shore of a warm, volcanic creator lake. 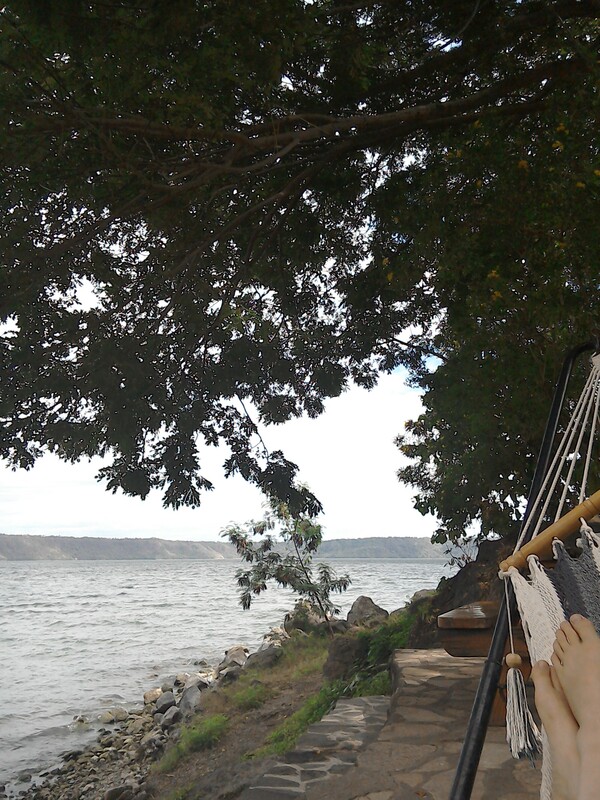 Lake Apoyo is the oldest lagoon in Nicaragua. Hundreds of thousands of years ago the volcano here erupted and left a huge creator. Over many years rainwater filled up the creator. Consequently, today there is a crystal clear, dazzling lake surrounded by lush forested rolling hills. The water is warm providing perfect swimming conditions throughout the entire year. Along the lake front there is a small handful of hostels, resorts and hotels. There is nothing thing else here but the lake, forest and one road leading to the lagoon – perfect chilling grounds. I have been lucky enough to spend two nights by the lagoon. During the days I have been sitting in hammocks, swinging chairs and benches reading, relaxing and taking in the stunning scenery. The sound of the lake’s calm waves rushing into the beach is so tranquil. I fell asleep swinging in the hammock listening to the calming, dulcet tones of the water sweeping in. As I woke up, looked at the blue, blissful, breathtaking lagoon I had to check I was not dreaming. The sun was lowering in the sky, lighting up the mountains in an exquisite fashion. The clouds lit up an orange. It was the perfect time for a dip in the warm waters. I swam against the waves, to a wooden floating platform where I sat staring at the picturesque backdrop of mountains around the lake. I went for a quick run down the dirt road around the lagoon which was slightly hilly but nice to be doing some exercise under shaded trees. I went straight in the lagoon to rinse off and grabbed a rubber ring to lie on letting the waves push me around as I admired the tantalising view. Later on I sat in the hammock some more, reading Shawshank redemption – a brilliant read. It’s fair to say I have had a very relaxing stay in Lagoon Apoyo. It is definitely worth a visit. It has been great to have some downtime from traveling which can be extremely tiring, lugging your rucksack from bus to bus,takes it out of you. -A shuttle bus can be taken from the Oasis hostel in Granada here for $5 US dollars. Some agencies try to charge more – do not be fooled. 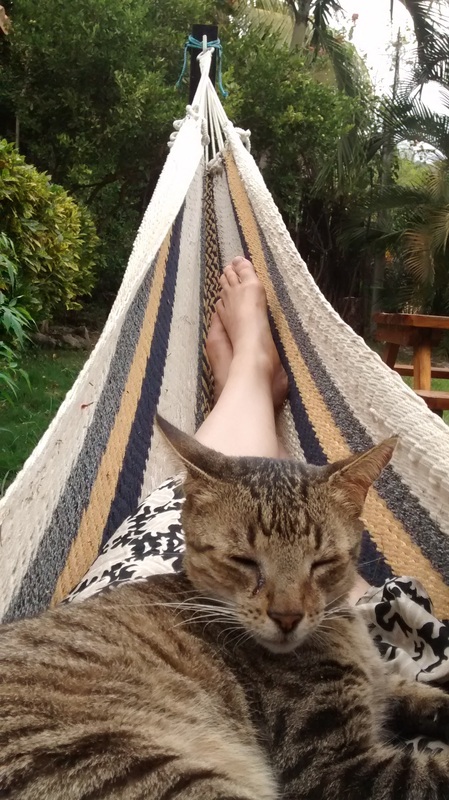 -I stayed in Monkey hut hostel which was fabulous – tonnes of hammocks, free tubes, kayaks and WiFi. -No supermarkets here but the hostel does have a kitchen. So if you want food buy it before in Granada. The hostel does have a restaurant, which is okay. Good pizza, fajitas and salads etc. But on the whole food is pretty average.